From a 40 year veteran space advocate and a Director with the National Space Society, with collaboration from a leading industrial development expert who has been involved in asteroid mining and several innovative multi-billion dollar mega-projects, and a skilled digital artist, comes a detailed and practical account of how the future of mankind in space can evolve in the short term, and where it can aspire to in the long term. Settling Space (ISBN: 978-0-692-99253-1) is the second book in this series (the first being Developing Space) and has been specifically developed taking into account the political and economic realities of human society, using the actual physical and chemical characteristics of the asteroids, Moon, Mars and the galaxy to construct a realistic, holistic and accessible space development agenda for humanities initial expansion from Earth. This agenda has been thoroughly researched and referenced, with extensive background calculations and simulation results provided, however it is presented in such a way as to be easy-to-read and understand, with the reader deciding how far they want to evaluate and verify the underlying basis and calculations. In Settling Space, John Strickland Jr, with industrial development expert Sam Spencer (Principal Technical Development at Clean TeQ, and the Director and Principal Consultant of Etiam Engineering), along with the talented artist, Anna Nesterova, have created a book that clearly and absolutely defines what humanity needs to do to become a multi-planet, and eventually multi-system, species. 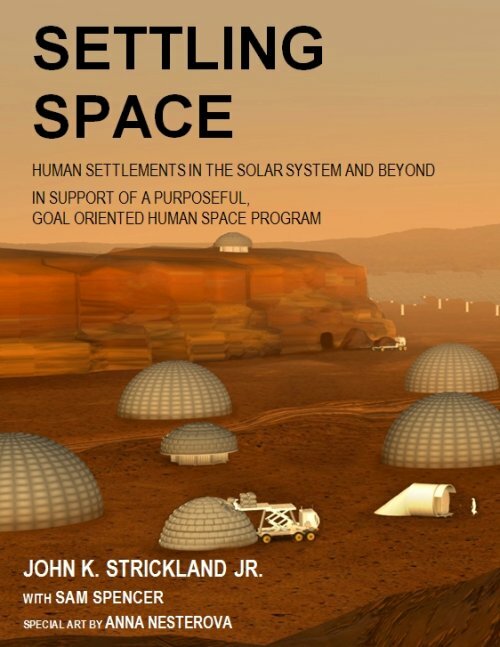 This book includes sections on the settlement of Mars, asteroids as a resource, the settlement of space, building rotating settlements in space, terraforming, realistic starships and exoplanets. For further information on the book see the Settling Space drop-down menu at the top of the page.